Are you at the point in your life where something needs to change? Do you find yourself going through the motions, but unable to reach your goals? 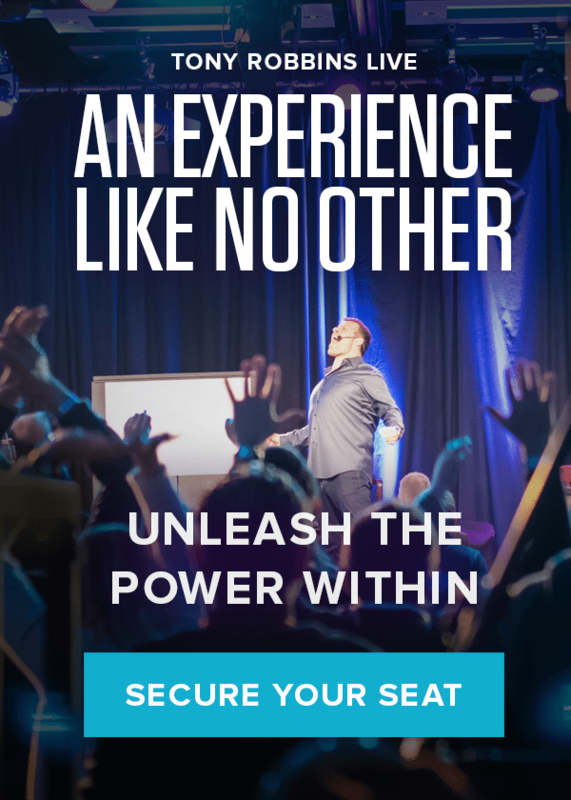 Tony Robbins’ Unleash the Power Within (UPW) event challenges participants to break down self-imposed barriers and to start living the quality of life they’ve always dreamed of. Are you ready to take your life to the next level and give – and receive – more than you ever imagined? Find out how these two attendees changed their lives after attending UPW. Peter Diamandis brought the rocket into the future. He is a pioneer of innovation, started eighteen companies, is driven by grand challenges and believes in driving radical breakthroughs for the benefit of humanity. Even though he is the definition of an overachiever and powerful leader, Peter had limiting beliefs that were holding him back, and he often found he’d rather focus on heading toward Mars than diving into his own issues. He found that the strategies Tony taught at Unleash the Power Within helped him unblock, refocus and up his game even more. Continuing to practice Tony’s strategies, Peter now makes time to prime each day and recites mantras to help center his focus on things that will further propel his life’s purpose. While Peter has attended several Tony events, he always wished his team could join him so they could unleash their full potential and gain the emotional drive to take themselves further. Bringing his team to Unleash the Power Within proved to be exactly what they needed to start working in the direction of their goals. “It’s giving us a brand-new language for conversation,” Peter said. Instead of Peter returning from an event and making the effort to teach them new concepts, this time they all learned together. As a team, they were able to get the power of conviction, clarity, mission and drive necessary to keep innovating and commit to the same outcomes. It’s a small change in the scheme of things – just learning how to communicate with one another and drive for the same goals – but the smallest changes can lead to massive results. When the team left UPW, they were ready to make “the moonshot,” as Peter describes it, and change the world. That’s what’s at the core of a decision to step up your game: Effective massive change in and for yourself, and ultimately others. Watch the video below to hear more about Peter’s experience at Unleash the Power Within. Lakeisha Michelle is a CEO, hairstylist, musician and creative artist who lives by one motto – strive to be the best and never stop learning. She was first introduced to Tony Robbins through one of his YouTube videos about how to raise your standards. Taking his lessons to heart, she wrote down what she was tired of and worked toward eliminating those feelings in her life, but soon reached a plateau. She wanted to go further, but wasn’t sure how. Once she recognized these negative thoughts and understood that the story they formed in her mind created a barrier, she learned how to dismantle them – and even better, how to stop them before they formed. “I know how to figure out what the belief is now,” Lakeisha said, “What it’s speaking to and how it’s gonna show up if I don’t infuse that positive reinforcement.” Tony Robbins empowered Lakeisha with the strategies to change her mindset and break through her status quo. Lakeisha’s weekend at Unleash the Power Within gave her the calmness and certainty that she would be able to achieve anything she set her mind to. Watch the video below to hear more about Lakeisha’s story from Unleash the Power Within. When they finally decided to focus on what was really important, they were able to unleash the power within. The same thing will happen for you once you decide to step up your game. If you’re ready to commit to changing your story, find out what Peter, Lakeisha and countless others have learned at Unleash the Power Within by attending the event yourself.